Had an interesting encounter with Nevada yesterday afternoon. It was cool and overcast when I got to the barn around 2:30 or so. It didn’t look like they got as much rain out there as we got here at the house (just under 3”! ), so it wasn’t especially muddy, thank goodness. 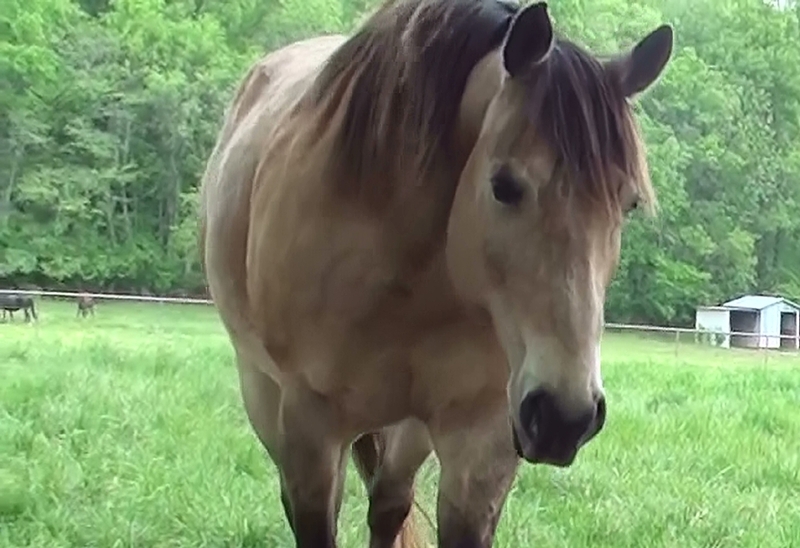 Nevada and the mares were grazing toward the east side of the pasture, keeping an eye on one of the barn staff, who was trimming bushes along the fence. She acknowledged me when I arrived, but didn’t offer to come over, and declined to walk with me back to the fence where I’d left her food (out of sight). I stood around with her for quite a while, just watching and being in the moment, matching her movements and hanging out. It was so pleasant outside for a change! After ten or fifteen minutes, I checked again to see if she’d come with me—nope. So more matching/mirroring for a while longer. Still nope. So then I decided to move her around a bit, to get her more in the mood to follow my lead. I kept her going, slowly and gently and in no particular direction, but wouldn’t let her stop and graze. After a little while I began to direct her over toward the west fence, away from the herd. She went, but stopped every few feet and moved as though to turn and go back to the others. When she did that, I just pointed toward the fence and gently raised the tip of my stick (if I hadn’t had the stick, I could have just signaled with my hand). She’d then walk along a few more steps and stop again, asking if I had changed my mind. I think she thought I was going to take her out of the pasture, and while she would have gone with me, she wasn’t too much in favor of the idea, for whatever reason. But when we got near the gate and I motioned away from it and toward where I’d left her feed pan, she figured out what was going on. Then she was more than willing to move with me. Food! After her dinner, I walked back with her toward the rest of the mares. She moved easily in that direction, but stopped every time I asked her to, so it was clear that she was walking with me, not the other way around. Halfway across the pasture I asked her to stop. Then I backed away to break our connection, and sent her away quickly. She trotted off with a little toss of her head. 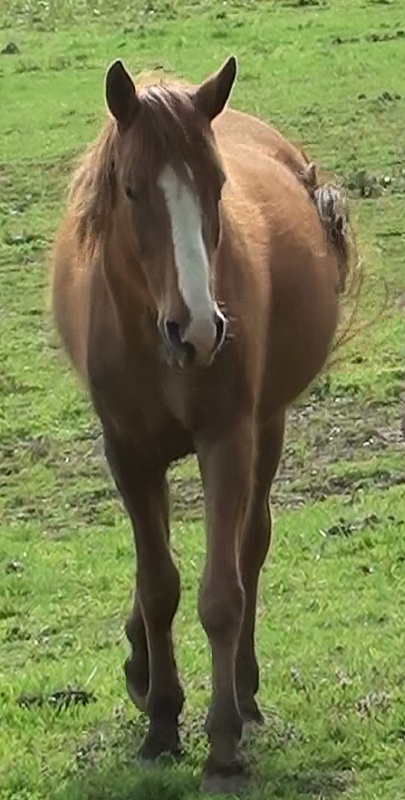 Galahad, on the other hand, came over to me from way across the pasture almost as soon as he saw me. I met him halfway and we walked back to the fence together. He also stopped whenever I asked him to. Galahad wanted to go out, though. As far as he is concerned, all the fun stuff happens outside the pasture, and he hasn’t been out for a while…too hot for this old lady! When I tried to send him off after he ate, he kept running off and then circling back to the gate. “Out, Mom! Let’s go out and play!” I never did get him to actually go away. Eventually, I just laughed, called him over, and did a few minutes of moving around and backing up. Then he got the last carrot and I left. Love those horses! Every day is different, and the two of them have such different personalities. It’s exciting to be around them, and to just let them be themselves like this. The vet came out to see Nevada the other day to check out some possible causes for the violent itching that she’s suffered from, off and on, as long as we’ve had her. It wasn’t pleasant for her—it involved shaving squares on her neck, skin scrapings, worming, shots. She stayed calm and willing during the interaction, which seems amazing but is normal for her. The next afternoon I went out to the pasture to get her. True to form after an unpleasant experience the day before, Nevada let me know she hadn’t enjoyed it. She’s always been this way—never complaining during whatever the not-fun event is, but being hard to catch the next day. This time, she came to me in the pasture, all right. She quickly checked me over to see if I had dinner or treats (nope). Then she was willing to follow me, without a halter, to the gate of the summer pasture and go through it into the winter pasture. Once there, though, she wouldn’t stay with me—she trotted off toward the main gate to the barn and arena area, where I usually feed her before we work on anything. I just let her go. When I didn’t follow her to the gate, she watched me for a while (I was walking the other way, pretending to ignore her). Then she ran back toward her girlfriends, whinnying. I didn’t chase her, but just kept on pulling weeds and “ignoring” her. She stopped near the fence between her and her buddies and started grazing. 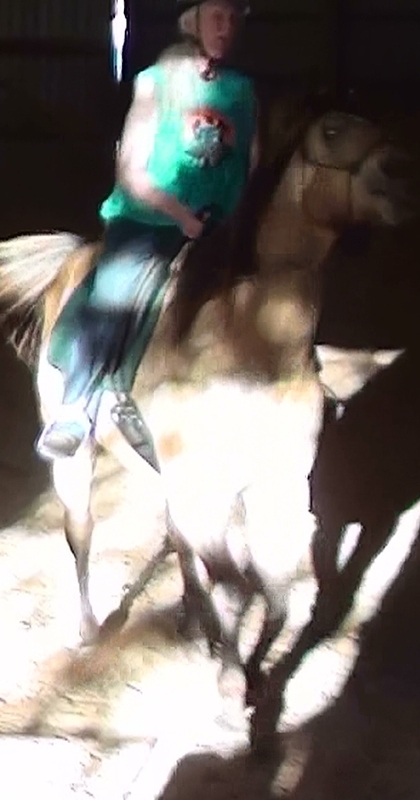 I’m beginning to enjoy the challenge of figuring out how to get my horse to want to follow my lead, especially when they’re “not in the mood,” distracted, or disinterested, without resorting to making them do it in the natural horsemanship way. That way is effective, all right, but this one is way more fun. “Courting” is a great Carolyn Resnick concept; Linda Salinas, one of Carolyn’s certified trainers, has a blog post on the topic here. So I decided to court my mare. After pulling weeds at the other end of the pasture for ten minutes or so, I walked slowly toward her, stopping every time she twitched an ear or looked up at me, in order to show her that I understood and respected her boundaries. She didn’t move her feet. Finally I worked myself around to the front of her and went up and said hello, offering my hand. She snuffled me willingly enough, but she went back to grazing, and I backed away. A few minutes later I greeted her again, and again backed away. At that point she started slowly and casually taking one step at a time toward me while she grazed, and each time she did, I backed up an equal amount. I wanted to draw her to me, but not in an obvious or insistent way. This felt respectful: I wanted to wait until she was ready and wanted to come to me. 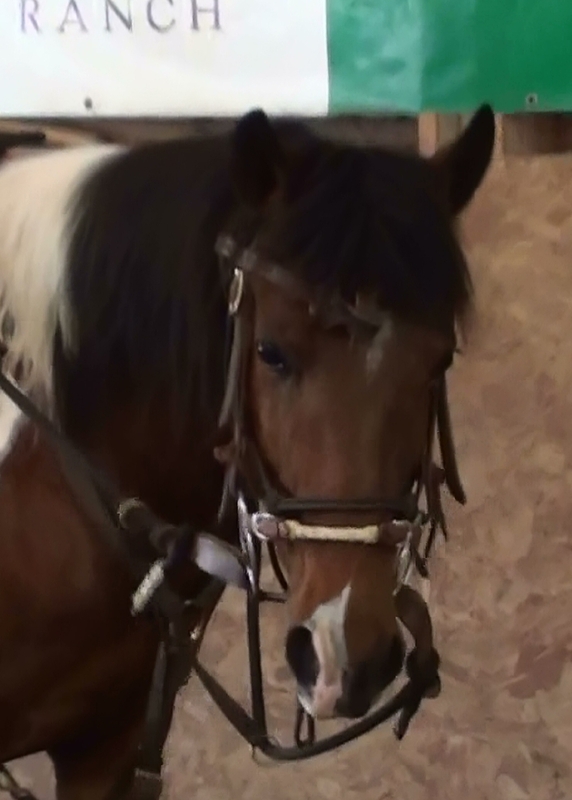 Finally she put her head up, looked at me intently for a few seconds, and walked over so I could put her halter on. It was her idea at that point, not mine, and after that there were no problems between us. It was such an interesting and rewarding experience. It felt like a real conversation: She got to tell me how displeased she was with what had happened the day before, and I could respond that I understood and didn’t blame her for it. Once she felt “heard,” she was willing to come to me. I’m certain that’s not exactly how Nevada perceived it, but I do believe her version wouldn’t be too different. It feels like magic to relate to my horses in this way. There’s no confrontation, no force, no “well, that’s fine, but you have to come with me.” They always have the option to say “no.” Sure, there are times (vet visits, for instance) where I will have to override their wishes, but that won’t be a problem, because in the majority of instances, they get to choose. I can always pick a different game, or a different approach: one that will be easy and fun for them to get involved in. I’m so happy about the way Nevada and I handled this situation. I think it will make a big difference in our relationship, and that’s wonderful!